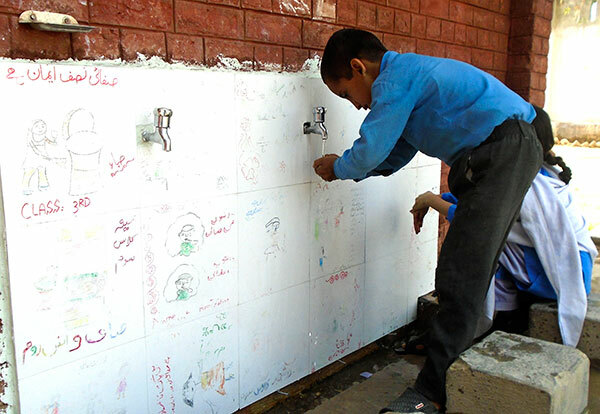 Since 2011, the Association for Aid and Relief, Japan (AAR) has built toilets and hand-washing facilities in elementary schools in the north-western Khyber Pakhtunkhwa province of Pakistan. 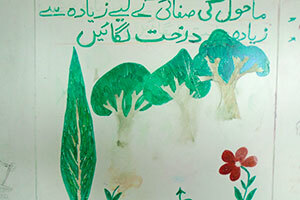 In February 2018, the schoolchildren had their very first experience of decorating these facilities with tiles on which they had drawn pictures. 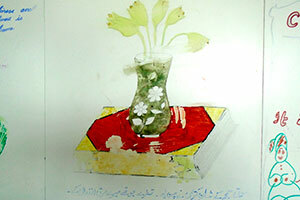 Shajeha Khan from our Haripur Office in Pakistan reports on the project. What colors shall I use? “Come and look! I drew a wonderful picture using lots of colors!” On February 8, 2018, the children of Hattar Elementary School located in the Haripur District of Khyber Pakhtunkhwa province gathered excitedly in the schoolyard. Using 12 different colored crayons, 25 students ranging from third to fifth grade drew pictures on the tiles used for decorating the walls of their toilets and hand-washing facilities. Each student was given a tile (approximately 30 centimeters squared in size) by the AAR staff. 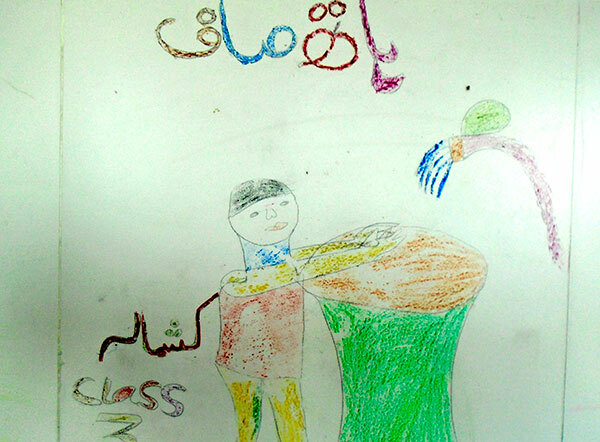 Then, in groups of 4 or 5, the students began drawing pictures on their tiles featuring themes such as health, hygiene or cleanliness. AAR had undertaken construction and repair of sanitary facilities in many elementary schools, but this was the very first time that the teachers and schoolchildren were involved. After discussing how that could be achieved, AAR decided to let them decorate these facilities themselves. 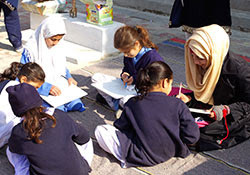 By introducing this project, AAR hoped that the teachers and schoolchildren would feel attached to the facilities that they helped design and eventually come to take diligent care of them. Not only that, drawing is a lot of fun for the children! This picture conveys a message that brushing teeth in a proper way is very important. 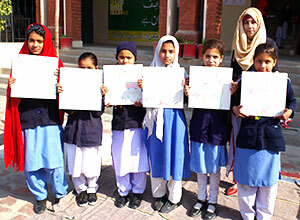 The schoolchildren were put in groups of four and spent an hour and a half drawing these pictures. “Cleanliness is half-truth,” which is one of the pillars of the Islamic faith that “you must keep your body clean, the surroundings neat and organize your thoughts”. In order to prevent a cold or disease, you must follow the instructions for washing your hands. 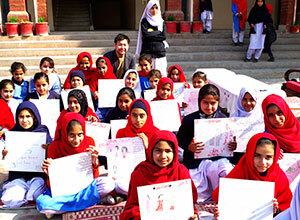 It is obvious from the photos what this project meant to the teachers and schoolchildren. We could tell from the drawings that the schoolchildren fully understood what we had explained to their parents in the briefing session which was also part of the project. In the summer of 2018, we organised a session for the teachers and parents of this school, explaining the importance and methods of teaching the schoolchildren about health issues. 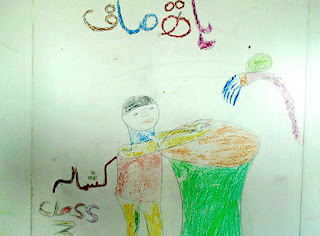 We were incredibly happy to see that what we had explained was all reflected in the pictures that the children drew! 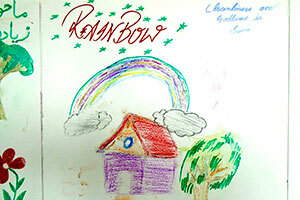 Watching the children drawing their pictures with passion, I could see that the sanitary facilities in this school would be treasured and used with the utmost care. 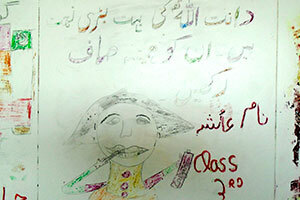 I also drew a picture on one of the tiles with the following message: Hygiene and health are the biggest blessing from God. It means that, if we keep ourselves clean and healthy, we can think and act in a positive way. This project was made possible thanks to your donations and the NGO-related funds provided by the Ministry of Foreign Affairs in Japan.